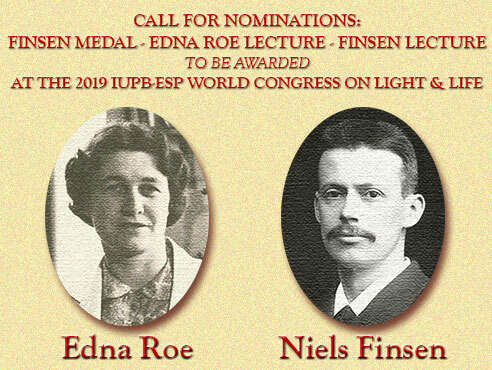 IUPB is soliciting nominations for candidates for Finsen Medals, Edna Roe Lecturers, and Finsen Lecturers. Finsen Medals are awarded to distinguished photobiologists for their outstanding contributions to the photosciences. These medals recognize scientists who have worked in the photosciences for a considerable number of years. Edna Roe Lecturers are promising photoscientists who have achieved breakthroughs or similar accomplishments in the photosciences. Traditionally, most Edna Roe Lecturers have been women. Finsen Lecturers are promising photoscientists who have achieved breakthroughs or similar accomplishments in the photosciences. The awards are to be presented at the IUPB-ESP World Congress on Light and Life (Joint 17th International Congress on Photobiology & 18th Congress of the European Society for Photobiology) to be held in Barcelona, Spain, on August 25-30, 2019 with awardees' travel expenses to be covered by IUPB. All IUPB members societies, individual members and excecutive board members can recommend candidates or apply by him/herself. Deadline for all nominations is Friday, March 23, 2018.